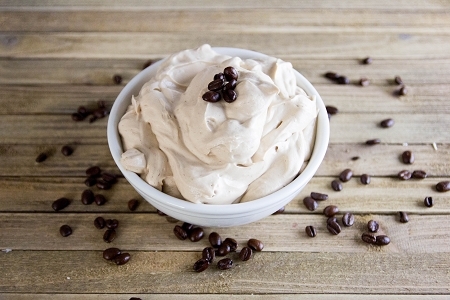 Our instant Cappuccino Mousse mixes combine the flavors of sweet chocolate and rich coffee in diabetic-friendly desserts. Easy and delicious—just add milk, whip and chill. Maltodextrin, Whipping Base (Partially Hydrogenated Coconut Oil &/or Palm Kernel Oil, Corn Syrup Solids, Sodium Caseinate (a Milk derivative), Proplylene Glycol Monoesters, Lactic Acid Esters & Sodium Aluminate), Nonfat Dry Milk, Mocha Cappuccino Flavor, Corn Starch, Carrageenan Gum, Tetrasodium Pyrophosphate, Modified Starch, Caramel Color, Modified Cellulose, Vanilla Flavor, Sucralose, Acesulfame Potassium.